Many of these fish are brightly coloured or have a scintillating metallic sheen to their bodies, making them a delight to watch as they dart to and fro. As well as the highly sociable and popular tetras, this group includes the piranhas, made legendary by tales of their aggression and ability to strip prey to the bone in a matter of seconds. The characins include several families and number more than 1200 different species, mostly from South America, with some originating in Africa. One characteristic feature of characins is the presence of the small adipose fin on the back quite close to the tail. When setting up an aquarium for tetras, you must ensure that you use soft, acidic water, which also encourages spawning. Many of these fish, especially the most dazzling species such as cardinal tetras, show to best effect when kept in shoals. They generally inhabit the mid-water level. Provide a well-planted tank with subdued lighting, to enhance their colour. When buying neon tetras (Paracheirodon innesi), avoid choosing from tanks containing fish that appear dull and pale. Although bright lighting can make them seem poorly coloured, the pallid appearance may also indicate neon tetra disease, a parasitic ailment for which there is no cure. Far less colourful, but no less fascinating, is the X-ray fish (Pristella maxillari). This has an extraordinary, transparent body, but may have black, yellow, and pale pink areas on the fins. The spinal column is clearly visible, while the internal organs are obscured in a silvery sac behind the gills. In spite of their apparently delicate appearance, these are not difficult fish to maintain in an aquarium. Other tetras also have semi-transparent bodies, although they tend to have some colour apparent. They include the black phantom tetra (Megalamphodus megalopterus), which has a distinct black blotch behind the gills on each side. The bleeding heart tetra (Hyphessobrycon erythrostigma) is generally regarded as one of the more sensitive species. Initially, keep the water temperature in their quarters raised to around 28°C (82°F), then lower it gradually once they become established; this also helps make them more resistant to opportunistic fungal infections. It is often wise to stock the aquarium with relatively hardy tetras, then add more delicate species once the water has matured and is more suitable to their needs. You can help them to settle in without problems by diluting some of this mature water with conditioned tap water in the isolation tank, before transferring the fish to the established aquarium. You may notice fin damage in certain tetras when you buy them, most often those with elaborate fins such as the emperor tetra (Nematobrycon palmeri), especially the males. Provided that the damage is not serious, however, then the fins should regenerate without problems, but watch closely for signs of fungus during this stage. 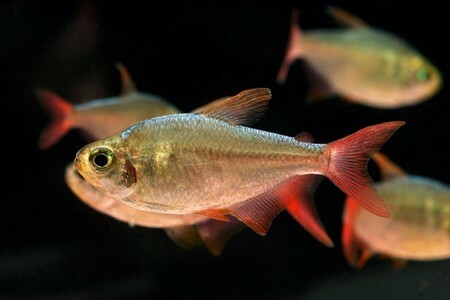 Among the African tetras, the Congo tetra (Micralestes interruptus) is popular for its amazing iridescence. Be warned that poor water quality leads to a deterioration in the condition of its fins. Adding peat to their quarters helps to create favourable conditions, and spawning is quite feasible in aquarium surroundings. These strangely shaped characins live near the water surface – often looking as if they are suspended there – where they feed primarily on small insects. They may also jump out of the water to catch food, using their pectoral fins as wings, so keep the tank covered at all times. Include trailing plants in the aquarium because they like some degree of shade. Hatchetfish are especially partial to fruit flies, but will happily eat proprietary flake foods as well. When buying these fish, check for signs of white spot, to which they are susceptible. Not all characins have an amenable nature – the group includes the notorious piranhas (Scrrasalnius species). Although their aggressive nature has reached mythical proportions, piranhas should certainly not be housed with smaller companions, even of their own species, nor should you introduce another of their kind subsequently, because it is liable to be attacked. Aside from their feeding frenzies, these fish are otherwise surprisingly inactive and are generally quite easy to keep, although they are very unlikely to breed in an aquarium. 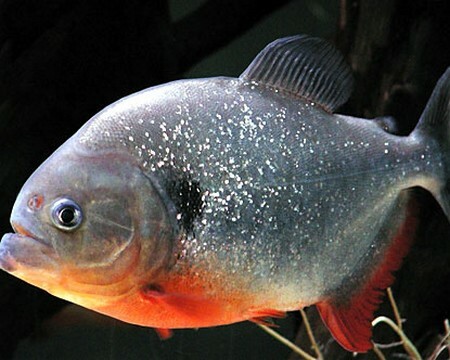 Like the piranha, the black-finned pacu (Colossoma oculus) grows quite large, so even a small group needs a spacious aquarium with a good filtration system. It closely resembles the piranha, but has distinctly different feeding habits – it is largely vegetarian.